Algae Photobioreactor Harvester Extraction System Here’s my idea for the algae photobioreactor/harvester system. This removes the need for expensive and energy draining dryers, conveyors, and centrifuges. PROBLEM: Most systems currently available are not energy efficient, use massive amounts of electrical energy, and materials and equipment are highly expensive. 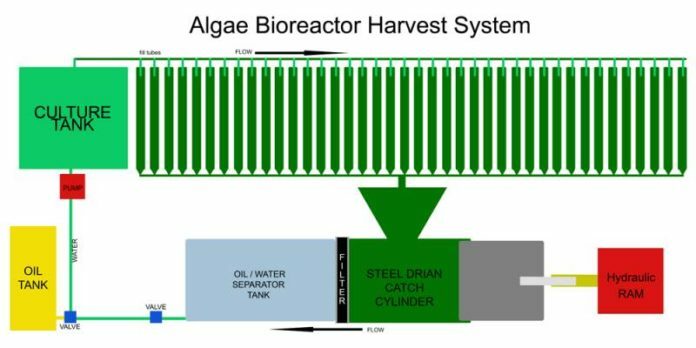 Economically inefficient and energy intensive algae farming systems require massive energy and expensive equipment and technology to operate. This drives up the cost per gallon of biofuels and bi-products produced with the leftover algal biomass after oil extraction. SOLUTION: The concept is simply to drain the photobioreactor tanks containing the algae/water using gravity fed systems into larger steel cylinder similar to a giant tank and use a hydraulic ram to press all liquid water and oil from the algae through a steel/charcoal filtration system. This should, if it works, remove all need of dryers, lighting, conveyors and centrifuges which require massive amounts of electrical energy to operate. After pressing the algae through the system, there would be a large “plug” of biomass left over which can be dried and palletized outdoors, using the Sun’s energy to finish drying. This material can then be processed into feedstock, other products, or sold as biomass to pharmaceutical companies. The hydraulic ram system pushes the water and oil through the filtration system into a oil/water separator tank, whereby the water can be drained via a gravity back into the large Culture tank. Oil will then be drained into a holding tank to be processed into biofuel. Gravity Fed System: The whole system uses gravity flow in both directions. It also minimizes the use of electric water pumps. In this system there is only 1 pump and 1 hydraulic ram which use electricity. The hydraulic ram, can be powered by biodiesel fuel (which we just happen to produce) or electricity power by solar energy. The culture tank is a “water tower” 100 feet in the air, providing more than enough pressure to fill all the photobioreactor tanks. The water tower can be filled using a small 10,000/gallon/hour pump. Since the photobioreactor/grow tanks are vertical, draining them into the steel cylinder/press is simple and uses no energy other than gravity. The hydraulic ram is the only energy consumer in this line. Then the oil/water is separated via gravity with a simple valve system at the base of oil/water separator tank, which feeds into the the culture tank, completing the closed loop system. Oil is lighter than water and floats on top of the water. Once the water is drained out of the separator tank, the second valve can be flipped and the oil drains into the oil tank. At that point that oil merely needs to be filtered/cleaned, which can also be powered by a gravity fed oil filtration system. Governments and corporations are turning to microalgae for biofuel and feedstock solutions. Some species of algae produce 50% or more lipids (oils) through a photosynthetic process. These oils can be extracted from large algae farms to product biofuels like, biodiesel, biogasoline, and biojetfuel, as well as plastics, adhesives, and even food products for humans including protein pills, pharmaceuticals, cosmetics, and feed for livestock. Algae based biofuels are being considered as a substitute for fossil fuels. Method: Form a small scale pilot project farm to test feasibility of the system. OIL PRODUCTION VOLUME (Yield) per 5000 gallons algae/water: One 5000 gallon vertical photobioreactor tank will produce approximately 4.71 gallons Algae oil per day. DOUBLE YIELD: Conceptually, we can double the yield by going vertical/higher with the same diameter tanks. Going to a 10,000 gallon 4800 tank system will produce approximately 16,503,840 gallons of oil annually. 1) 1 fourth to 1fifth shuold be canged every 2 weeks.2) No, you can use fake plants.3)I like schooling fish like zebra dantios and neon tetras. A predatory fish would be cool if you have the room. Tigerbarbs are good but you can not mix them with any other fish. Bettas are cool too, they need little room and are easy o take care of. I would not suggest a goldfish because they need a lot of room and are very dirty. Whatever fish you pick you shuold google it and do some research before you buy the fish. Be sure to cycle the tank. Be sure to add no more than two fish a week and allow the fish to change to the water temp. by floating the bag for 30 min to an hour.4)Twice a day. Only give tham what they can eat in a few secconds.5) Make sure that you buy the right kind of fish food. I don’t know of any brand names off the top of my head but I like to use food that brightens the color of the fish.Good Luck with your new fish keeping!